The upcoming summer games has me thinking more than ever about how easy it is to prepare healthy international cuisine on a daily basis. Take for instance the classic French Ratatouille; a recipe that mixes the best of your summer bounty into a rustic meal. Too busy to cook during the week? 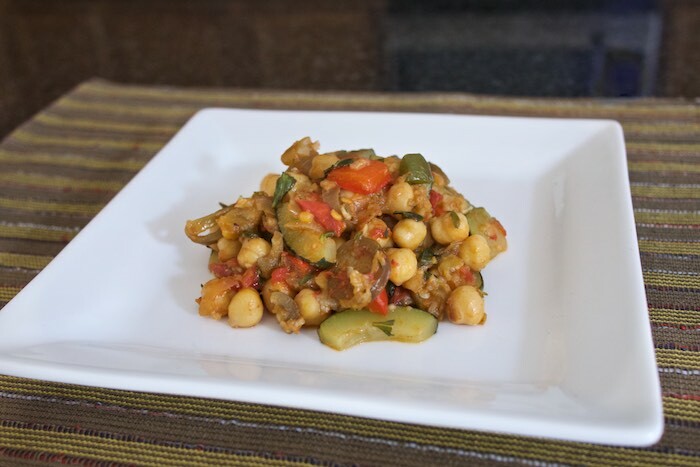 Chickpea Ratatouille can easily be made ahead and reheated for those nights when you need a home-cooked dinner on the table quickly. This hearty stew is delicious served hot or cold; on its own or over rice. Thanks to #TeamFarberware & their PURECOOK™ Ceramic Non Stick Cookware cooking healthy weeknight meals is super easy. The PURECOOK™ Ceramic set heats fast and evenly, is oven safe up to 350 degrees and comes with shatter resistant lids. What's really nice is this beautiful set is stain resistant and dishwasher safe! Enter below for a chance to win a PURECOOK™ set of your own! Then head over to Farberware to grab the full recipe for this healthy dish that makes vegetables the winner! I love the dark Blue Color! That turquoise is so pretty! I love a veggie packed ratatouille, but I love that you have added some protein with the chickpeas too. O I love ratatouille and chickpeas are perfect to make it much more hearty! This recipe looks delish! And I love those turquoise/blue pots and pans! So creative with the chickpeas. I love Ratatouille! Beautiful cookware too. I love ratatouille! That aqua color sure is pretty! Sounds delicious. And I love chickpea dish. Thanks! I am most interested in the blue color. Our entire kitchen is accented in the same royal blue color. I love that it has chickpeas in it. Makes it so filling! Beautiful color on the cookware! Japanese Eggplant? That's awesome! That's a first for me. I wonder if I'll be able to find this at my local food market or grocery store? The dark blue is my choice. Gray would be the most practical for me. I would never have thought to add chickpeas to ratatouille. I can imagine the flavours work really well together! I love the aqua color...thank you so much for hosting this giveaway. Excellent competition! Those pans look super. Love the chickpea curry too, packed full of flavour and protein. Great use of both chickpeas. They are such a great protein sub for meat. Perfect for a fast weeknight meal. Oh this sounds absolutely delicious! Gray is practical but the Lavender is FUN. I'd love any color! I need to make this dish! I love your take on this French classic! I love this and think it would be perfect for my daughter's first apartment. It has to be red!! I love all the red things. Red cookware would ROCK in my kitchen. The ratatouille looks delish - perfect for Monday nights! Ohhh I like the gray color! The aqua is my favorite color, but the gray seems more practical. My favorite PureCook cookware color is Gray. Chickpeas are the best Peas! BLUE IS THE COLOR FOR ME! IT WOULD BE PERFECT WITH MY 42 YEAR COLLECTION OF DISHES. Gray or blue would go best in my kitchen. Yum! Look at all those veggies! I'm loving the aqua color! i love the aqua color! but i also love the lavender as it is so unique and different! I really like the gray color. The aqua is so pretty!